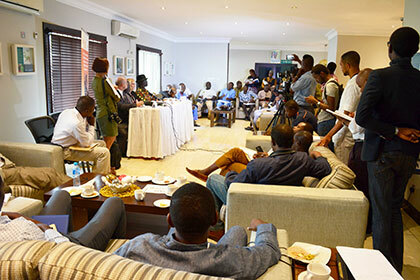 Press conference on IITA50 at the Ikeja Guesthouse, Lagos. As the core celebration of the Institute’s golden jubilee draws near on 24 July, IITA recorded three simultaneous “firsts”, all on 30 June when management went all-out to announce the anniversary celebrations in Lagos State, Nigeria. For the first time in 50 years, the Institute convened over 60 representatives from the local, regional, and international press at its facilities in Ikeja, for a briefing to highlight successes in the last 50 years and the direction for the next five decades. On the panel answering questions and clarifying issues from the press were Kenton Dashiell, Deputy Director General (DDG), Partnerships for Delivery; Hilde Koper-Limbourg, DDG, Corporate Services; Robert Asiedu, Director, West Africa; and Kwesi Atta-Krah, Director, Systems and Site Integration and Chair, IITA50 Anniversary Committee. They also spoke on ongoing research, partnerships, funding, governance, host country relations, facilities, R4D directions, research impacts, the IITA50 celebration, and future research focus. The team then proceeded to the 22nd floor of the Nigerian Stock Exchange (NSE) on Lagos Island where IITA initiated a partnership proposal with the NSE and also recorded another feat—ringing the closing gong on the trading floor! Kwesi granting interview on TV. the bell. 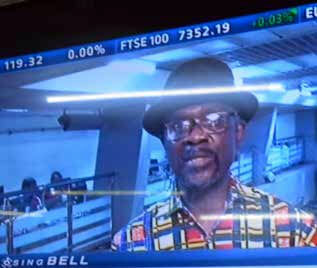 This particular ceremony was aired live on CNBC Africa and Channels Television. DDG Dashiell also received a miniature replica of the closing gong on behalf of the Institute. Dr Dashiell speaking on behalf of IITA Management. “The NSE is part of a sustainable stock exchange association and believes in the sustainability goals. As a result, NSE specifically associates with institutions and individuals who showcase best practice and make a big impact in society in general. We (NSE) know the role of IITA is particularly important in Africa today, considering that the continent will continue to increase in terms of population and economy over the next 30 to 50 years and food security will become a strategic and survival issue to power Africa’s emergence into the 21st century and into a global economy over the years to come. 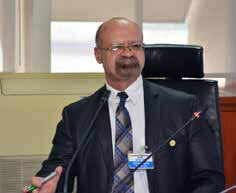 We are extremely proud of the work you are doing and hope you continue to do it,” Bajomo said. To cap the day, Kwesi Atta-Krah was interviewed live for 10 minutes on CNBC Africa where he spoke elaborately on how IITA—working with government and national agricultural research systems—is helping to harness the next generation of farmers. Watch the interesting video here.